9NINE Baked mixed seeds snack bar, coated with carob topping. Perfectly packed with sunflower, pumpkin, sesame, hemp and delicious carob, this bar brings luxury snacking to the healthy eater. Mixed seeds (sunflower, pumpkin, sesame, dehulled hemp) (64%), Sugar, Rice syrup, Vegetable oils (palm, rapeseed), Carob, Soya flour, Emulsifier: Sunflower lecithin, Salt. Gluten, wheat, egg, yeast and artificial colours and preservatives. May contain traces of other seeds and some natural bits and bobs like husks and stalks. Also, may contain nuts, peanuts and milk. 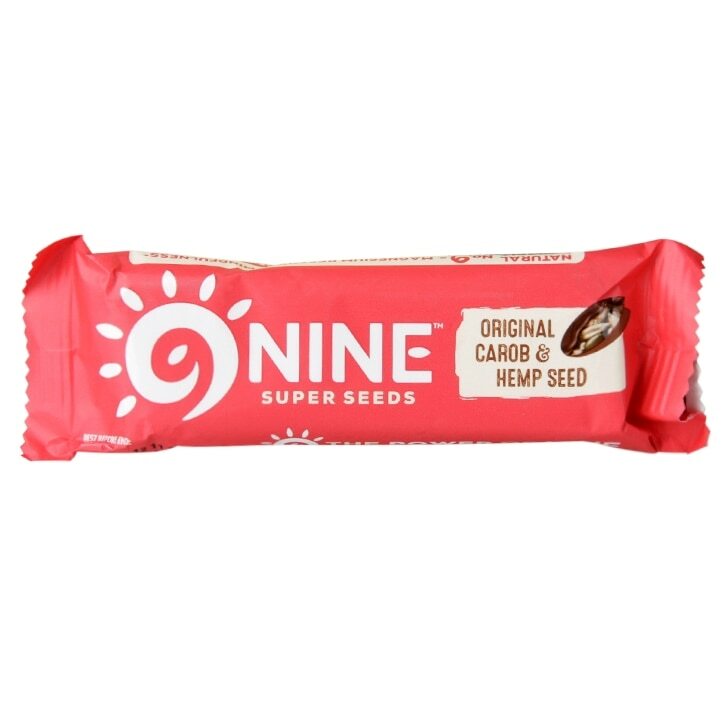 NINE Original Seed Bar is rated 4.4 out of 5 by 9. Rated 3 out of 5 by Izzygrace from Yummy but shame about the sugar Tastes very nice but shame about the added sugar in it. Rated 5 out of 5 by Ali75 from fantastic food! Wow! It tastes good and by gum, it does you good!! Rated 5 out of 5 by Debdwi from Superb breakfast for backpackers! Took these on a 10 day walk when we were camping and carrying everything on our backs. There is no rubbish in these bars, unlike many similar things which are full of sugar; they are jam packed with seeds and have a carob top - delicious and nutritious! Just what we needed for a fuss-free breakfast with a cup of coffee. Excellent! Rated 5 out of 5 by Anonymous from Great as always The 9-bars continue to be excellent, for emergencies (no food in the house), or on walks, backpacking etc. Rated 3 out of 5 by kazbaz from Unpleasant texture I personally don't like the texture of this bar. I like seeds but not in this form. Rated 5 out of 5 by bard from Delish! Recently discovered these bars and they are FAB! Really nutricious, exceptionally filling. I now buy them in bulk and keep a box full in my desk at work . Have one a day for either lunch or breakfast and they sustain me til next mealtime. Love the carob topping too!